Like many South American countries local dishes in Peru are sometimes best eaten by avoid thinking vegetarian (and I mean vegetarian not pescetarian, which is possible by the sea) and loving meat. 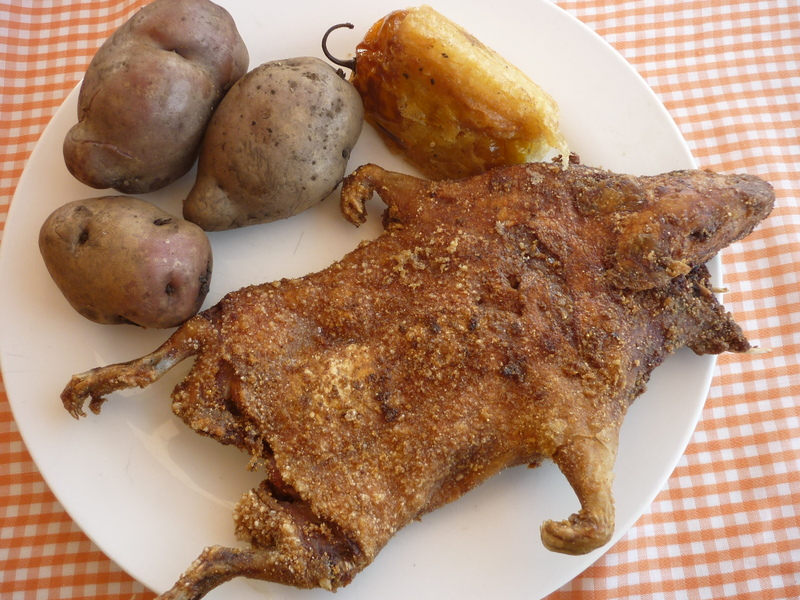 Most local dishes in Peru consist of meat of some kind, whether this is flesh from any animal, like guinea pig (see picture to the right and see if you fancy it), a Peruvian speciality or Alpaca (Llama) or tripe (mondongo) or fried pig fat (chicarron). 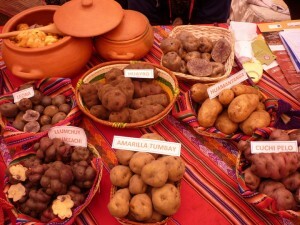 Peru also has a wealth of ingredients especially in the potato department! There are so many types, shapes and sizes that it will blow your mind! A purple potato? Sure, it makes tasty purple mash! Check out the knobbly potato in the bottom left of the picture. They have streaks of purple running through and really do take friend sliced potato to the next level. Local dishes in Peru have a wealth of ingredients at their disposal. Avocado, quinoa, numerous varieties of sweetcorn in an array of colours, peanuts and heaps of different beans all from the local area makes a region that is rich in incredible ingredients. These ingredients and the Peruvian dishes are only just today becoming recognised and we are sure will end up taking a prevalent role in the world’s most well respected foods. A feast of delights in our recipe book of dishes based on 2 and 1/2 years research, signed as a thank you. Online price is now only £24.99.…where all of these fine recipes have been taken.